Q14 is a modern luxury residential building in Washington, DC that is a bit reminiscent of a partially assembled Rubik’s cube. Located at 1401 Q Street NW in Logan Circle, the square structure was designed by Bonstra Haresign, and features two interlocking portions surrounding a taller core, plus steel and glass corner sections, and three-sided jutting glass bays. Completed in 2006, the building has just 28 residences for seven floor. Needless to say, some of these condos for sale are quite spacious. As intriguing as the exterior is, the real treat is entering these one, two and three-bedroom city homes, and feasting on the stunning design elements. Floor plans come in both flats and multi-levels, with wrap-around window walls and private terraces with mahogany and steel trellises for shading. There are also heated hardwood floors, and starkly contemporary chef’s kitchens with professional grade Bosch and Sub-Zero appliances. At the top of Q14 are the corner penthouses with 19-foot ceilings, fireplaces, floating stairs, 800 square-foot terraces, and bi-level glass walls. 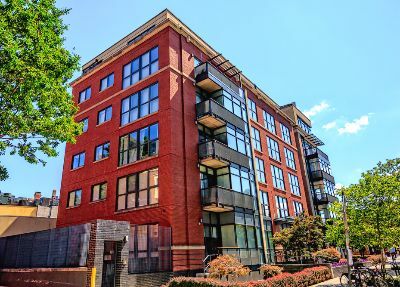 Condos for sale at Q14 start off in the mid-six figures and climb to about $1.8 million. But if you decide not to pony up for a penthouse, there is still a common roof deck for everyone. Because sharing is good, right? Other amenities include a posh club room for neighbors and guests to gather at, plus a bike room, parking and extra storage. It is also a pet-friendly building. Located just two blocks from the famed traffic circle itself, the building is close to many wonderful things. Such as a Whole Foods, Vida Fitness, Flow Yoga, Studio Theater, and a slew of great bars and restaurants, like Barcode, Black Cat, Logan Tavern, Drafting Table, Estadio and many more. With its distinctly modern mien, the award-winning Q14 is a nice addition a historic neighborhood with a vibrant urban pulse.